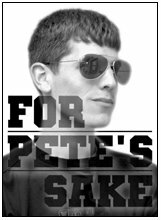 FOR PETE'S SAKE IS SPORTS COMMENTARY ON BASEBALL, FOOTBALL AND WHATEVER ELSE IS WRITTEN FOR THE ENJOYMENT OF EVERY FAN. Novak Djokovic addresses the media before he opens play at the 2013 BNP Paribas Open. World No. 1 Novak Djokovic says he's feeling good ahead of a busy tennis month starting with the BNP Paribas Open in Indian Wells this weekend. "Couldn't ask for a better start of the season, winning Australia and Dubai, playing on hard courts, which is my most successful and most preferable surface that suits my game the best," Djokovic told the media on Friday. The Serb said the start of this season feels the same as 2011, when he compiled a 43-match winning streak and remained undefeated until the French Open semifinals in June. That year Djokovic captured the BNP Paribas Open title. "I don't want to predict anything. My mindset will stay the same, and that is to enjoy the moment, to be in the moment, to try to do my best in the present, and take it step by step and then see how far I can go," Djokovic said. During that 2011 season, Djokovic beat Rafael Nadal six times in route to claiming the No. 1 ranking in men's tennis. Nadal is marking his return to major competition in Indian Wells after seven months off battling a knee injury. "It's now been three tournaments in last four weeks for Rafa, and, you know, he doesn't show any signs of pain in the knees and something that can distract him now. He's on the right way, you know," Djokovic said. "As his colleague and friend, I can say that it's really great to see him back for our sport in general, for fans, for everyone who loves tennis,because he's such a popular and charismatic player and is recognized all over the world," the Serb added. Djokovic also told reporters he's ready for a busy March with Indians Wells, Miami and a Davis Cup event in Boise, Idaho on his plate over the next five weeks. "It's not going to be easy, but, again, it's three events in five weeks. It's still all right," Djokovic said. "I know how I need to treat my body, how I need to, you know, prepare for this kind of physical involvement. So I'm looking forward to it." 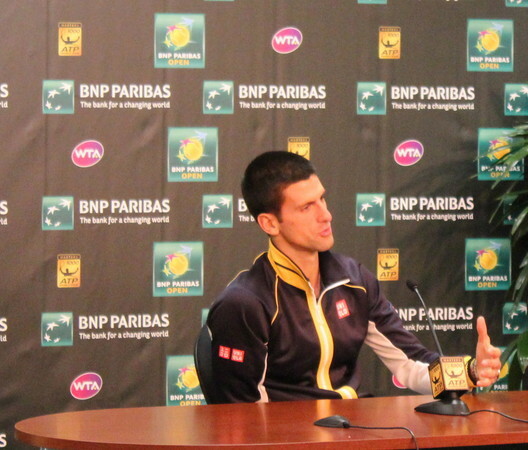 Djokovic admitted he really enjoys the Davis Cup, because it's a rare occasion where he gets to feel the team spirit. As for playing in Boise, Idaho he did not know much. "I informed myself through Google and Internet," Djokovic said with a chuckle. "I have seen that there is an altitude obviously of 800 meters, and that goes to favor obviously of American team. On the other hand, I don't know. I wish I could go skiing in Sun Valley, which is very close. But unfortunately, I'm going to have to stay with the racquet and play my best and try to get a win." Victoria Azarenka defended her Australian Open title with a gritty performance over the weekend after enduring a wacky end to her tournament run. Her 4-6, 6-4, 6-3, victory over Li Na saw nearly 30 minutes of the match disappear thanks to three interruptions, including a lengthy fireworks display for Australia Day and a 10-minute injury timeout after Li took a spill slamming her head on the court. Ironically, it was a 10-minute injury timeout Azarenka called during her seminfinal match that set off heavy criticism from the media, players and turned some of the Melbourne fans against her. After failing to convert five match points in her second set semifinal against American teen Sloane Stephens, Azarenka took a medical timeout. She was taken off the sweltering court for treatment, then coolly closed out the match in the next game. "Well, I almost did the choke of the year right now at 5-3, having so many chances, I couldn't close it out," Azarenka said in her on court interview immediately after beating Stephens. "I just felt a little bit overwhelmed." ESPN's tennis analysts quickly jumped on Azarenka accusing her of gamemanship and calling the timeout to settle down, with Patrick McEnroe upping the ante calling the move "bush league." However, the match stats do not point to Stephens being cheated from making the finals Down Under. In every match category, from first serves in to unforced errors, Azarenka was just better. Looking at just the second set, Vika was better in most categories and tied in unforced errors. During the critical game before Azarenka's timeout, Sloane committed three unforced errors while smacking three winners. That's on par with her performance in the rest of the second set. Uncannily, Azarenka lost five match points during the third set at last year's U.S. Open to Serena Williams, letting her second major title slip out of her grasp. While Sloane beat Serena in the Aussie Open quarters, fans in Melbourne were likely only cheated out of a second set tiebreak. It is too much to conjecture beyond that. Azarenka admitted mistake in not calling the trainer soon enough in her semifinal match and handled a grilling by the media with poise (watch clips below). When it comes to dealing with injuries during a match, Azarenka has lost the benefit of the doubt with most players due to a reputation she developed for calling a trainer too often early in her career. Just last season during her coming out party, Vika was criticized by World No. 5 Agnieszka Radwanska for "faking" injuries in the semifinals at Doha. Azarenka went on to win that tournament, one of six singles titles she claimed all on hard court surface. In prevailing again Down Under, Victoria Azarenka has served noticed to the rest of the WTA, she is the one beat on hard court. There was an interesting juxtaposition today in the world of college football. As I watched the Army-Navy game, and parts of the I-AA (FCS) and D-III football playoffs, there were student-athletes playing the game they love for no other reason. Those playoff formats leave absolutely no room to debate who calls themselves champs. On the flip side, three D-I college football players were in New York for the annual beauty pageant known as the Heisman Trophy ceremony. That celebration serves as a nice segway into the way D-I (FBS) football settles its championships, which is also essentially a beauty pageant. Fans are stuck with the broken BCS system for this year and next, before we transition to a four-team "playoff." That will only make the pageant mentality worse. The days when college conferences were held together by academics and geography are gone. In this ugly new age, all that matters is perceived football prowess and access to television markets. That means even more universities are changing their conference allegiances. The latest shake up came on Friday with the expansion of Conference USA. Texas-San Antonio, Louisiana Tech, UNC-Charlotte, North Texas and Florida International all defected from their respective conferences (the WAC, Atlantic-10 and Sun Belt). That means 31 universities - more than a quarter in all of Division I football - will have switched conferences for various stated reasons such as stability or more prestige. Granted, most college presidents do not have the audacity to freely admit they are moving conferences to chase more money. With Utah State and San Jose State also finding new conference home in the WAC 2.0, also known as the Mountain West, you can, as Brett McMurphy put it, "start carving the tombstone" for the WAC. That's a shame considering the WAC is the sixth oldest D-I football conference and will have had 26 members at one time or another when the D-I expands to 125 programs in 2013. 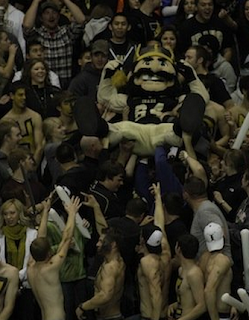 That also means a school near and dear to my heart, the University of Idaho, has been left in the lurch. The Vandals, despite doing things the right way with student-athlete graduation and leading the WAC Commissioner's Cup, are out of good options. Idaho is in a minuscule television market, it's regional TV footprint is over shadowed by the Smurf Turf to the south and there has not been any consistent success on the Palouse. What is being widely suggested by many sports writers for the Vandals, a drop back to the I-AA level and the Big Sky Conference, would be a disaster. Baseball has always been in my blood. I was attending professional games even before I was born. For me, no matter how much snow was on the ground, mid-Febraury was a sign that spring was just around the corner. And Major League Baseball's Opening Day has always been one of my most anticipated days of the year. I consider myself fortunate to have been able to go to so many baseball games. 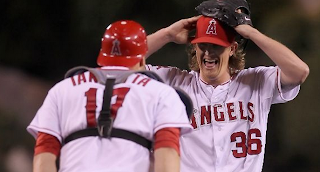 And I am lucky to have witnessed some amazing feats on the diamond in person, none more impressive than watching Los Angeles Angels pitcher Jered Weaver throw a complete game no-hitter. I first took notice Wednesday night that Weaver had given up no hits in the middle of the fourth inning, but thought it was way too early to be watching history. It wasn't until a perfect sixth inning when Weaver shut down the Minnesota Twins speed batters, Denard Span and Jamey Carroll, both whom did not even show bunt, that I thought we might be on the cusp of a special game. For the last two innings, Angel fans stood, imploring the umpire to call strikes and for Weaver to finish off the no-hitter. When right fielder Torii Hunter caught Alexi Casilla's fly ball for the last out, the stadium erupted, a crescendo that had been building for the last 30 minutes of the game. "I couldn't believe it," Weaver said after the game. "I never thought in a million years I'd first of all be in the major leagues pitching and to throw a no-hitter in the big leagues - it was very surreal." It was a surreal game to watch. As a former work colleague put it, Weaver's no-hitter was the final piece to my fan's cycle. Four stunning baseball feats that rarely happen. I've also seen then-Baltimore Oriole Aubrey Huff hit for the cycle, former Washington National Dmitri Young smack a grand slam on Fourth of July, and Philadelphia Phillies second baseman Mickey Morandini turn an unassisted triple play in 1992, the first such play in 24 years in the majors. Those types of plays make baseball fun for the fans. You never know what you might see on a random Wednesday night. Now I can just hope my Pittsburgh Pirates raise another World Series pennant in my lifetime, but I might just settle for a winning season at this point.